Pharmacy Management – FREE download! 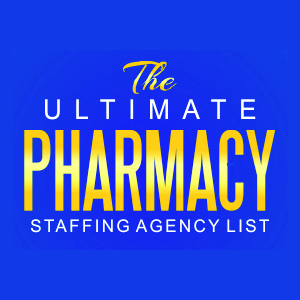 In my opinion (for what it’s worth) one of the best ways that retail pharmacists can add more diversity to their careers is by pursuing opportunities to become pharmacy managers. This is because the skills you will learn and develop as managers will often open many doors as companies are continually looking for experienced leaders to help promote their success. Management requires learning some new skills and being willing to focus your attention on broader issues and future goals. 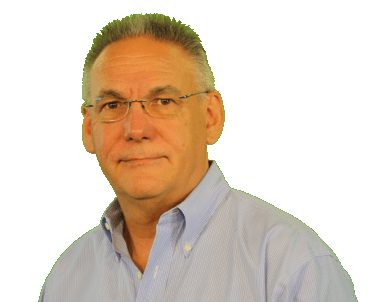 Greg is an experienced pharmacist himself, with lots of years spent in management and the ability to communicate what he has learned in a winsome and engaging manner. He also graciously agreed to answer a few questions I had about his book and about his advice for new managers. The problem is that Greg’s answers to my questions WERE TOO GOOD. Seriously. He invested a significant amount of serious thought and time, and frankly what he wrote seemed far more substantial than any blog post was worthy of. So, with his permission, I have put our interview into the form of a PDF document which I am offering as a FREE download! I would love for you to read his answers to my questions. 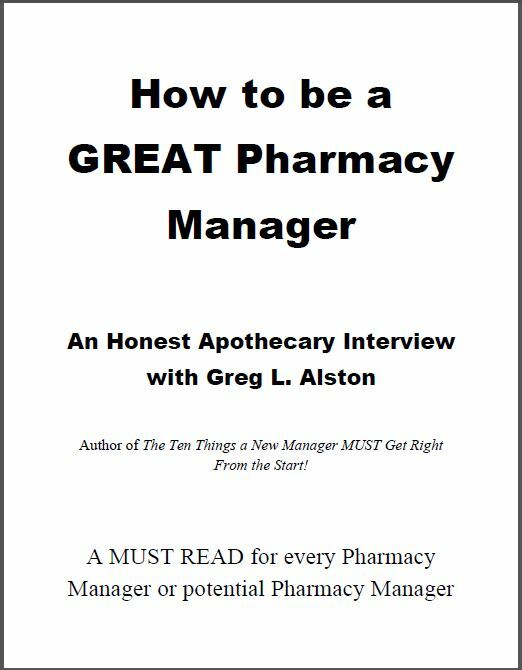 So if you are interested in pharmacy management and want to get a little flavor of Greg’s style before purchasing the book, I would sincerely invite you to fill out the form below and you will receive an email with a link to the download in a few moments. WHY DO I HAVE TO REGISTER FOR THE DOWNLOAD? Don’t worry. I am not going to share your email with anyone. Period. However, creating the download this way is the easiest way for me to gauge your interest in this topic, as I may like to write more on this in the future and possibly I could convince my friend Greg to share some more insights on this important subject. That’s it. So please, if you would like to read my interview with Greg, just register below to receive the FREE PDF! What is your own personal career background? Why did you write a book to help pharmacy managers? How well do you think our pharmacy schools are doing to prepare pharmacists for management? What are the key characteristics and qualities of great pharmacy managers? …AND SEVERAL MORE PROBING QUESTIONS AS WELL! So please take a moment if you are interested to download the very engaging 13-page interview with Dr. Greg Alston. You will receive a confirmation email in about 5 minutes, this will have a link. It will ask you to confirm you are human (this document won’t help aliens) and then you will receive the download link! It is that easy! Subscribe to Download our Document! 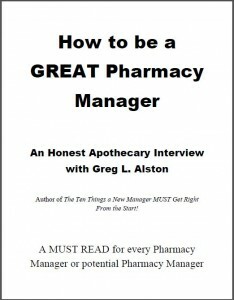 » Interviews, Pharmacy Careers » Pharmacy Management – FREE download!